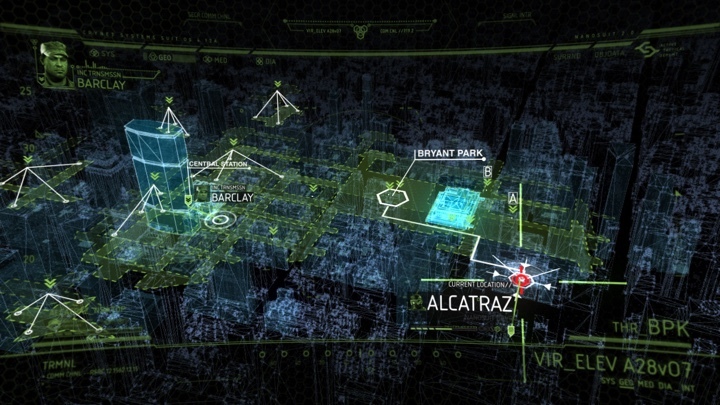 When we are surrounded by glowing screens wherever we go, what does it take to create believable and yet attractive computer interfaces for big-budget movie productions? In this conversation Shaun Yue talks about realism in representing the human-computer interaction in “Skyfall” and “Prometheus”, what does it take to place hundreds of live monitors on the set, his work on game cinematics for “Crysis” and “Call of Duty”, and how we may be interacting with information in the next few decades. Kirill: Tell us a little bit about yourself. Shaun: I’m originally from Melbourne, Australia. I studied Multimedia Design at Swinburne University; it was a mix of web, animation, video and graphic design. During that time I worked as a web designer, and this web agency shared office space with a film production company, Exit Films, who made commercials and music videos. I was really interested in the work they were doing, so during the time I was working at this web company – I helped them do motion graphics, and also worked as a director’s assistant. I tried to get on set and see the whole process of what it takes to make a film. In hindsight I was so lucky with the filmmakers I worked with – people like Garth Davis, Glendyn Ivin, Greig Fraser, they’ve subsequently gone on to achieve so much. It was an experience where I knew I had so much to learn; and was lucky to be in the right place at the right time. After that I kept working mainly in animated commercials, and was then employed by the Australian Centre for the Moving Image which is a cultural institution which exhibits moving image in all forms, from film to games and contemporary art. I did all of their motion graphics promotional work. It was an interesting break from commercial clients, and great to explore a wide breadth of the moving image cultures. Kirill: Were you always interested in working in movies, or did it come together like that? Shaun: I always loved watching movies and loved sci-fi. Whenever I saw a computer on film, I always felt strange. It was one of those things where I felt that maybe I could do that better. Kirill: Jumping a little bit forward as you talk about making things “better”. The “Alien” franchise started in 1979, and you joined it working on “Prometheus”. How do you define “better”? Is it in terms of raw processing power that you have at your fingertips and how intricate you can get? Is it about improving the interaction design, the visual design, or something else? Shaun: It wasn’t specifically a technical software solution to making it look more sophisticated, for example I think the computers in Alien are great, they have a very functional aesthetic. But so often screen interaction in film appears very naive, unbelievable as a computer user. And now that I’ve worked on a couple of movies, I can understand why it is a little bit fictitious or a little bit over-dramatized. But back then when I was watching movies, I was thinking that that’s not how computers work, and if I did it, I’d do it properly. Shaun: Right, the biggest thing about film is that they have a very broad audience. There’s often dramatic storytelling reasons to present something as it finally appears, rather than being authentic to technology. Balancing design authenticity with narrative concerns is probably the greatest challenge of the job. Kirill: Is it a back-and-forth process on the set, defining how “realistic” the interactions with computers are? Do you ever get feedback that what happens on the computer screens is too boring? Shaun: It depends on the movie. 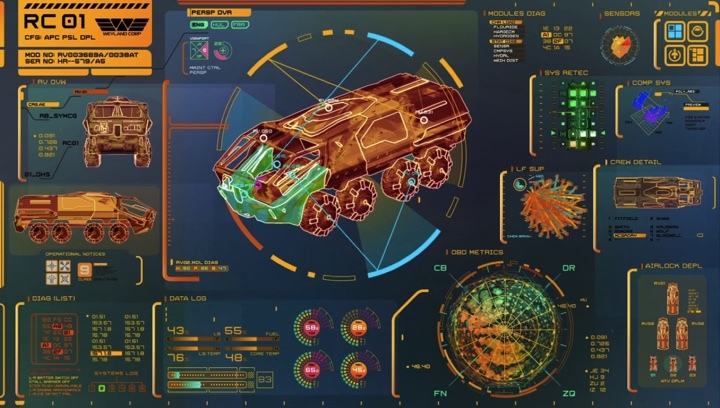 For example, in “Dark Knight” all the screen designs – which were designed with Toby Glover and Andrew Booth – are all DOS-based, engineering-based, very realistic, often sparse. It was about believability, and in that case the director never said that it’s too boring and let’s jazz it up. On the other side, “Prometheus” and “Skyfall” are very much about how can we show something that is beyond what a normal person is used to. “Prometheus” is set in the future, and it has to be more than what viewers are used to now, similarly with “Skyfall”, an element of a higher level of computers that the public doesn’t usually see. Obviously it’s a little bit of fantasy, but it was an important aspect of how the directors wanted to present computers in those films. Kirill: I have to say that after watching “Skyfall” a couple of times, I noticed that most of these sequences involve terminal-based interactions, with no flying 3D models of file systems. 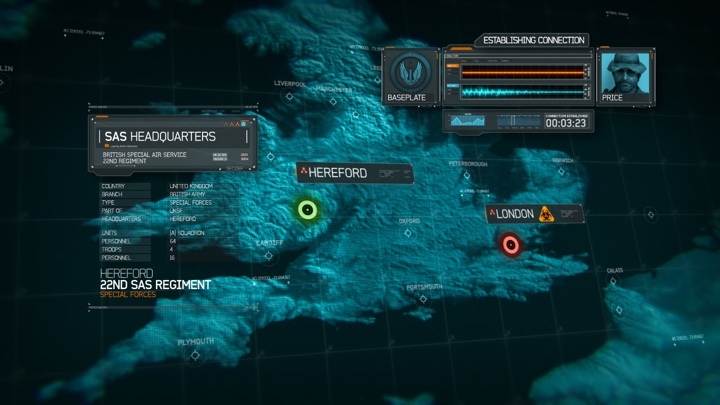 Every once in awhile it switched to vector maps of Britain, with a few textual layers on top of them, but otherwise, compared to the “usual” movie interfaces, it was very basic. Was the intent to expose a more technical side of things? Shaun: I’m really glad that you’ve said that. A lot of the articles regarding the computers of “Skyfall” scrutinised the hacking sequences because they are quite fantastically graphical. On “Skyfall” I worked for Blind Ltd, which is Andrew Booth’s company who I met through “The Dark Knight”. We really liked presenting information as text, like terminal – because this is what a lot of hi-tech computer users see. It actually much more technical than some fancy 3D graphical interface. The one sequence where Sam Mendes really wanted to exaggerate the computer graphics was in the “Q Branch” where Q hacks (or is hacked by) Silva’s laptop. There was a lot of script writing about the nature of the computer information and how Q was manipulating it. 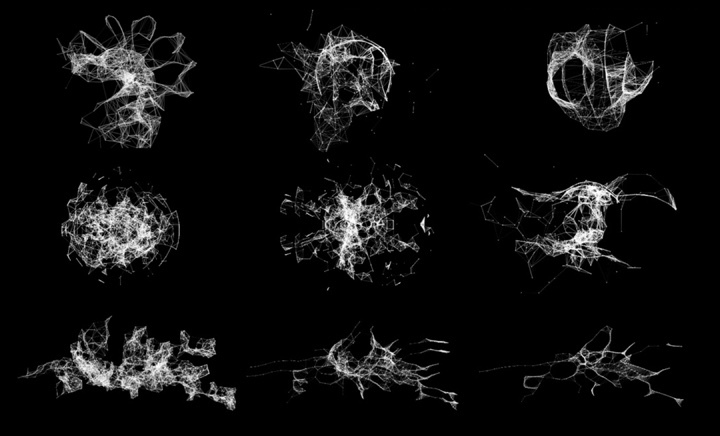 We presented the obfuscated code which is a spindly organic graphic (the polymorphic engine), which eventually transitioned to the depiction of the London Underground. 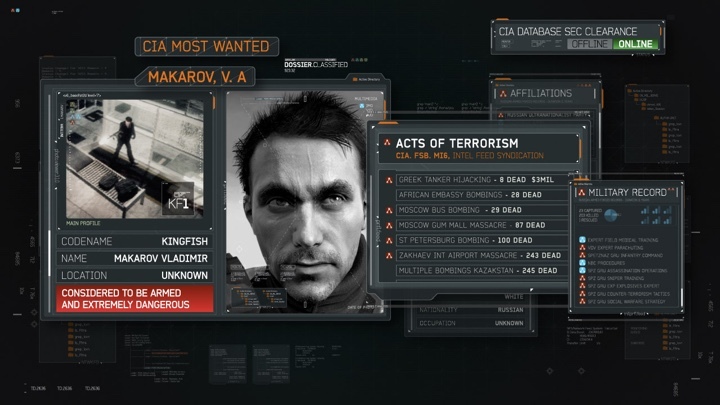 While that graphic sequence doesn’t represent computer hacking realistically, it was really a case trying to combining code and terminal-based interaction to manipulate these more evocative storytelling graphics. 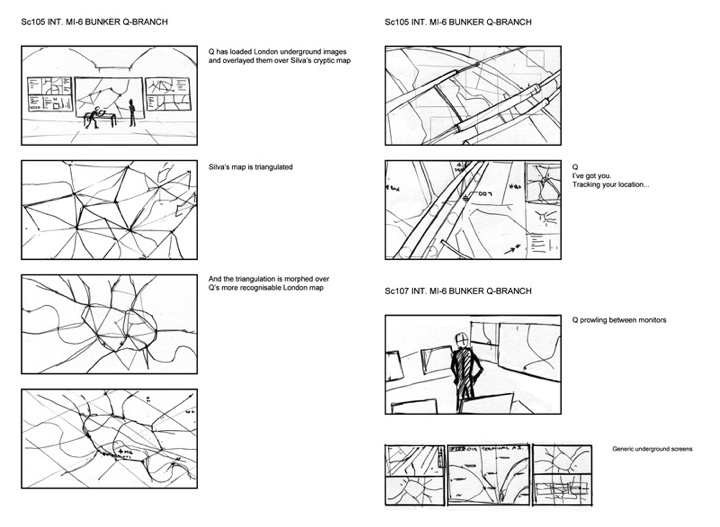 “Skyfall” Q-Branch storyboards. Courtesy of Shaun Yue & BLIND LTD.
Kirill: Was this look driven from your side, or more by the director? Shaun: I came on to Skyfall a little late due to prior commitments. By the time I joined, Andrew and his team had defined a lot of the look of MI6, how the windows worked together, and the user interface – they had designed it and presented to the director. It’s a collaborative process, but directors are generally more concerned with storytelling than UI specifics. One thing that we did was that when you see MI6 computers in the bunker and on the laptops – the style is quite rigid and robust – and then when you see Q later on, the operating system is all changed a into a more open, transparent blue interface. Like Q OS version 2. That was something which we liked to incorporate into the film as a bit of storytelling through the interface design, even though it’s quite subtle and not part of the main narrative. Kirill: Trying to draw a parallel between “Dark Knight” and “Skyfall”, if my memory serves me right, I don’t recall any kind of direct interaction between the main characters – Batman / Bond – and the computer. They look at the screens, but the interaction itself is delegated to the assistant figures – Alfred / Q.
Shaun: That’s a good point. I never really thought about Batman not using a computer that much, but I guess he has a lot of other cool gadgets! In “Skyfall” they took Q and instead of having him as the “gadget” man, they wanted to reintroduce him as a response to modern technology, living in a world of cyber-terrorism prevalent in today’s age. Q had to completely relate to that world. Although in the scene where they hack into Silva’s laptop, it is Bond who deciphers the key that unlocks the map. So even though Q providing the technology, the script emphasised Bond’s contribution and let him interact in a way which was natural for his character. Silva’s obfuscated map unfolded. Courtesy of Shaun Yue & BLIND LTD.
Kirill: “Casino Royale” was set to be the genesis of James Bond, and it was also the first one with Daniel Craig. “Quantum of Solace” picks off where it left, with Bond avenging the death of Vesper Lind. And now “Skyfall” has only one explicit timeline reference to the active period of service of Silva – in the late 1980s. But apart from that this film, at least for me, still feels like the part of the prequels to the originals, shaping his character throughout these three movies. Was this ever explicitly stated as a guideline for you, to kind of tone down the sophistication of the computer systems? Shaun: The screen design in “Quantum of Solace” was heavily stylised and the technology quite speculative. For “Skyfall” I think the idea was very much to bring the graphic style to something more contemporary and in our world rather than fantasy. But you do present an intriguing timeline of events when it comes to the Bond franchise, however it was never explicit, obviously also with M’s death. I think that one thing that Sam Mendes did really well on this film was to take the 50th year of Bond – an important historical milestone – to look at the past and to celebrate it, and at the same time re-calibrate it for the future, on its own terms. Kirill: Stepping back from the specific movie, what do you call yourself? There are a few definitions floating around, from screen graphics to motion graphics to fantasy user interfaces. Which one are you? Shaun: It’s challenging for me because I do screen graphics for films, cinematics for games, and also work on commercials and music promos which is a mix of compositing and motion graphics. “Motion graphics” or “moving image designer” are functional titles because you’re making graphics change over time. It doesn’t matter what medium or context it’s for. I’m quite interested in lots of different mediums and contexts, not just film. Kirill: Do you like the term “Fantasy UIs” in movies? Does it imply that they are too way out there? Shaun: Regarding FUI, I think “Fictitious UIs” is more accurate. Not every job we do is fantasy. For example, at the moment I’m working on a film that’s set in the last couple of years, and every design we do, we try to make it as authentic as possible. We’re being really meticulous about what timeframe the UI is from, and what timeframe the content and websites are from. Even Youtube, you look at it in 2012, and it’s different from 2010 and 2008. It moves so fast, and thank goodness for the Wayback Machine. I’ve really enjoyed that job because of the emphasis on authenticity, and because it’s very close to the job that art director does on a film. It’s not all about the coolest most fantastical thing you can design. It’s all about what can you offer as a craftsperson to contribute to the story. I’ve never personally used the term FUI [Fantasy UI]. I just say screen graphics, that’s what we’re designing – graphics which appear on screens. To be honest, I think it’s more important to be believable than fantastical. Defining the color language of “Prometheus” screens. Note how each subsystem gets its own distinct accent color – green for bridge, magenta for science/medical and yellow for generic. This is reflected throughout all the screens in the movie. Courtesy of Shaun Yue. Kirill: But then you take “Prometheus” which is set 70 years in the future. You have to go futuristic, you have to go a little bit into the fantasy land because you don’t have anything to fall back on. Shaun: How did you feel about the UI design in “Prometheus”? Kirill: I like the movie itself. It was very polarizing. There was no indifference, people either loved it or hated it. I enjoyed the interfaces themselves, and how they were integrated into the stereo productions. And I also didn’t think that it was that much into the future, given the depth and breadth of current explorations in the field of UX and UI design. Shaun: I think that’s a completely relevant observation. We visited scientists and other experts to discuss what might be in the future 70 years. And they said 70 years is so far ahead that we can’t predict it. We were talking about holograms, cameras which can read your mood, 3D printing that can morph in real time – maybe that could replace a screen. So many speculative discussions. Although we were specifically asked to disregard Alien, part of me worried about departing too far from the original. It has its own distinct aesthetic, and a lot Prometheus’ set design referenced from Ron Cobb’s designs on Alien. So how could we present something that couple hypothetically co-exist with Alien? When you look inside NASA control centers and spacecraft, the graphics do not appear very futuristic. Same if you go inside an air traffic control room and nuclear submarines – all of these very mission-critical settings. The graphics don’t become more sophisticated. If anything, they become simpler and more basic. You’re dealing with such important data that has to be processed. Bridge screen graphics for tracking the descent. Note the pervasive usage of green accent color. Courtesy of Shaun Yue. Shaun: That’s right. I was thinking about embracing “Alien”, pure texts or pure data, creating this link between the two films. However to be honest, Ridley Scott and Sonja Klaus (the set decorator) were not keen on that idea at all. He said “iPhones are boring!” It had to feel futuristic to the audience. It was pretty challenging, because like you say, the result is not strictly super futuristic when you look at some recent real world developments. There’s a couple of reasons for that. One is that these days we have iPhones, iPads, these amazing devices in our pockets. And to do that sort of thing on set requires software developers and being able to design graphics on set, almost like designing software to go onto shoot. And that is just to replicate current technology, let alone something 70 years in the future. Pre-production was really quick, we had to go from blank sheet to being on set with 200 screens in about 12 weeks. That involved not just the physical production of it, but also going through the design process with Ridley and Sonja. Science lab – still from the final movie. Note the number and variety of screens on the walls. Kirill: Just to clarify, what we see in “Prometheus” was playback on set, not adding this graphics in post-production? Shaun: There was a combination of on-set and post-production graphics, and my involvement was with the on-set screens. I was based at Pinewood for almost six months while they were shooting the interiors. We had around 250 physical screens, from inside of the bridge, the vehicles, corridors, mess deck, science labs, even the costumes had a dozen internal screens – a lot of physical screens. In addition to the creative process there was a massive amount of logistics in procuring and installing the functioning screens. George Simons did a stellar job supervising the whole process. In way it helped bridge Prometheus into the world of Alien, because the previous film had quite a distinctive screen presence. As you say, in the future you probably won’t have physical screens. Everything will probably be a hologram. To be honest, in my mind in the future you will have images implanted into your brain. The idea of a screen in the future is quite regressive, but in designing sets for films its a practical reality. Science lab screen graphics. Note the pervasive usage of magenta accent color. Courtesy of Shaun Yue. Medical lab screen graphics. Note the pervasive usage of magenta accent color. Courtesy of Shaun Yue. Shaun: Yes, can you imagine if you had everyone had their brains just plugged in? It wouldn’t make for a very visually dramatic bridge, would it? It would have to be incorporated at the script-writing stage. Fundamentally, the way Ridley approached screen graphics for this film was very much to not worry about usability, or how things might look in the future, just approach it as an artistic task. We’re providing color and light and texture to the sets, and not worrying too much about what the future is actually going to be in 70 years. It will be completely different, and it’s not about predicting the future, but rather about creating an interesting impression. It was almost like we were making moving paintings to be put around the set. Kirill: Did you do anything in the post-production stage? Shaun: Unfortunately I wasn’t involved in post, as I had moved onto “Skyfall”. My involvement was really from pre-production, and throughout principal photography, however many of the design elements and ideas we developed for the on-set graphics were incorporated into the post shots. The visual effects studios did a great job with the post graphics. There was the alien planetary system – the orrery, the holo-table and also the Alien digital recordings. One of the lead companies for that work was Fuel VFX, it’s always heartening to see great work coming out of Australia. 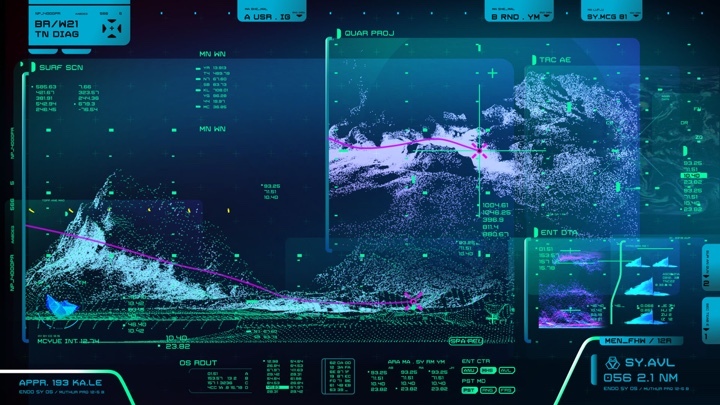 Post-production provides the opportunity to present graphics in the most futuristic speculative way without the physical constraints of on-set shooting, so it was a critical element on Prometheus. Prometheus holo-table designed by Fuel VFX. Kirill: Was it any different for you to work on a production shot in stereo? Shaun: Because the graphics were on set, there was no difference at all. In the end, you’re presenting something physical. One great thing they did on this production was to do as much as possible practically – whether that was the sets or stunts or the special effects or, in our case, the screens. It really helped the image feel tangible and not synthetic. Originally there was talk about having holograms on top of the pilots’ consoles on the Bridge, but in the end due to cost they used projections, and while that doesn’t look as futuristic as a hologram, the thing that you gained was the light spilling onto the set and onto the actors – a lot like in the opening sequence in the original film where you see the screens reflecting onto the helmets. That’s something that would be very difficult to do in post. In terms of the stereo, as you’re shooting something physical, it’s fine. Kirill: Do you have any problems shooting physical screens and getting the camera shutter out of sync with the vertical synchronization of the screens? Shaun: I’m not super-technical with the actual playback of screens – we had a team from Mark Jordan’s company, Compuhire. If it’s LCD, it’s fine. You can shoot those, but back in the old days of CRT monitors you had to synchronize their refresh to the film cameras, which made things a little bit more complicated. But now you just need to make sure that the color temperature is right. Kirill: As the time goes on, do you need to be more meticulous as we’re moving towards ever growing resolutions on the side of both shooting and theater / home viewing? Shaun: These days you might have a screen that is HD, almost film resolution. We’re having to do animations to play on set that are almost the same resolution as the visual effects shots in the final film, but we have to do a hundred of them in the same frame. It’s pretty crazy. For example, the screen that Q interacts with – that’s a 4K screen. That’s a higher resolution than the Alexa camera they were shooting with. It’s pretty challenging because it’s quite easy to upgrade monitors, and and it can result a massive amount of data and rendering. And you don’t get any more time, you just hope that computers get faster! 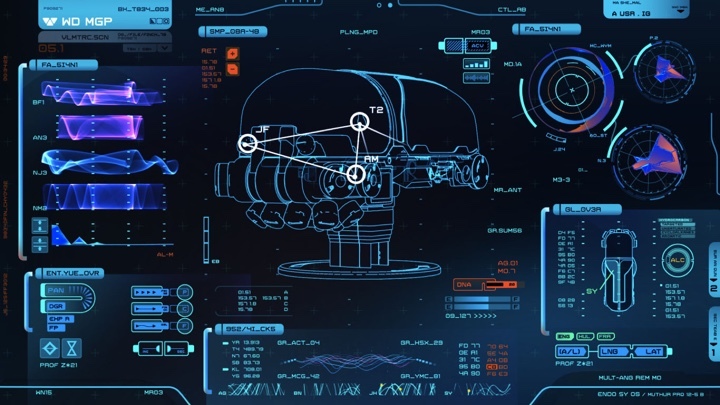 Kirill: And even with the ever-increasing capacity on both hardware and software tools available to create screen graphics and visual effects, it seems that the complexity and cost of creating them is climbing ever higher and higher. Is it the growing demands from the directors, or your own competitive desire to create something uniquely impressive for every production? Shaun: Definitely directors want the most they can possibly get, and that’s totally understandable. And as artists, if we get a faster computer, we’ll try to use it even more. We’ll always try to produce even better work. It never really ends, we’re insatiable when it comes to speed and just wanting to do better work. I think everyone wants the same, to do a really work that we’re all proud of. Kirill: Is the industry in the arms race against itself? Shaun: It’s really competitive. Everyone wants to do great work, and we would like to do it as economically as possible. Maybe some tasks will become easier and more economical, but there’s always the type of film that’s pushing the boundary as far as possible. Even if it’s not pushing the boundary in quality, it might push the quantity – and to to produce it all on a shorter schedule. Potentially the technology can solve a lot of problems, but in the end these economic constraints will probably never be resolved because clients always want to raise the bar, and that’s a natural desire. Kirill: I keep going back to “Sky Captain and the World of Tomorrow” as this attempt to create the entire world inside a computer-generated environment, with actors moving in a completely green screen sets, or “Beowulf” that tried to enhance the facial expressions of the actors and got into this uncomfortable uncanny valley. Will we see more experimentations of this nature? Shaun: You just have to look at “Avatar” – that is the template for a successful CG based film production. What is successful in that film is fully CG, and that will grow. I don’t think it will replace physical sets, because most films can’t afford to have everything made on a computer – it’s really expensive. It’s expensive because to create a photorealistic version of the simplest set, requires many artist-hours and so much render time, and why do that when you can have that simple set that looks photographic physically, and real actors that interacting with it. Photoreal CGI productions will grow, but it will never replace something that can be done quickly, cheaply and effectively. Kirill: But that brings it back to “Avatar” and to how many directors can pull off such an enormous budgetary request from the studios. Shaun: The thing that makes James Cameron amazing is that he had a vision to say that he was going to make a virtual film, and the idea of reconstructing virtual sets in a physical environment – all the terrain that the motion-captured characters walk on – they created that physically. It wasn’t a visually representative set, but rather these puzzle pieces where they could walk up and down slopes, sort of a big volumetric playground. That was really innovative, and the fact that he placed himself into the scene, allowed the talent act towards camera – he really took conventional filmmaking and put it into this virtual world. It is still a different style of filmmaking, and if other directors are interested in that approach, then I’m sure it will grow. Kirill: And in between your work on feature films you also worked on cinematic trailers for two big games – Crysis and Call of Duty. Can you talk a little bit about what is actually involved there? Shaun: Again I worked with Blind on Crysis 2 and 3 for Crytek/EA, and with a another London company, Spov on the cinematics for Modern Warfare 3 (Sledgehammer Games/EA). 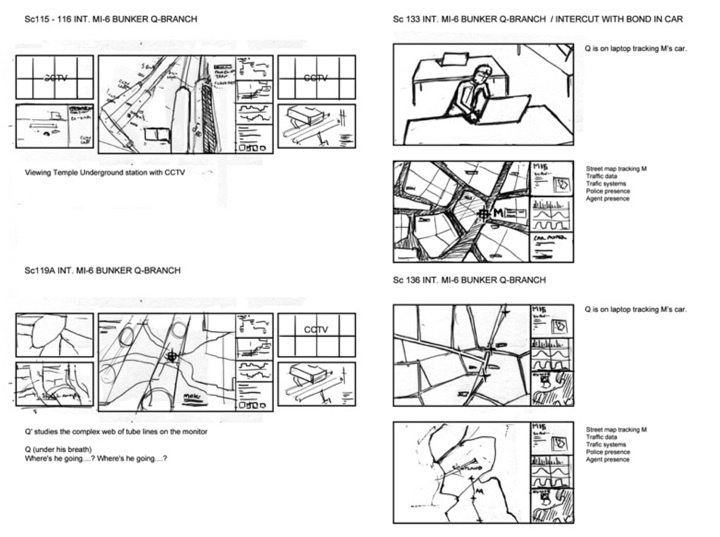 It is about taking the game assets and creating these storytelling sequences that go in between missions. It’s a good way for the player to relax a bit and receive a bit of a passive storytelling. It’s interesting because you’re telling the story through the screen graphics. Unlike the film where you’re not sure if or how they’re going to shoot it, on a game you know it will be closely scrutinized, and you’ve got to tell the whole story. You don’t have the aid of the editing or actors, the flow of the film plot to help you. I find that really interesting – telling a story purely through user interface graphics. Call of Duty: Modern Warfare 3 game cinematic, produced at Spov Ltd.
Kirill: Are these requests from games studios heavily scripted? Shaun: They start with scripts, and hopefully you get voiceover for timing. The scripts have general narrative objectives, but games companies like to keep things flexible. They can change things sometimes quite late, but at the same time they also give us a lot of opportunity to push our own ideas. Kirill: How would you compare working on feature films to working on shorter game cinematic sequences? Shaun: A 30- or 60-second shot on a film is a really long shot. You’re doing more work on these game sequences than you are on individual screen in a film. On a film you have to do a hundred screens, or maybe you’ll get a key sequence. It’s a comparable amount of work. The tricky thing with games, as I said earlier, is that it’s the animated sequence in isolation, so you have total responsibility over the storytelling. The difference with these game cinematics, you’re producing almost everything in that sequence, whereas on a film you are part of a much larger group. There are all these people that built sets, costumes, actors, and amazing cinematographers all combining into a concentrated moment, whereas on a game you have 30 seconds almost all to yourself. 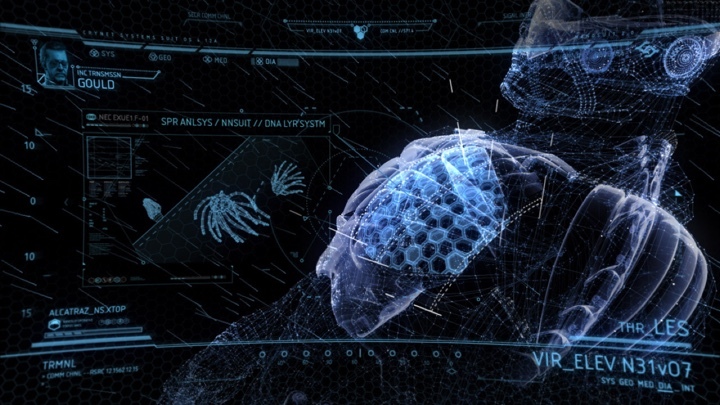 Crysis 2 game cinematic, produced at BLIND LTD.
Kirill: Let’s talk about the software. 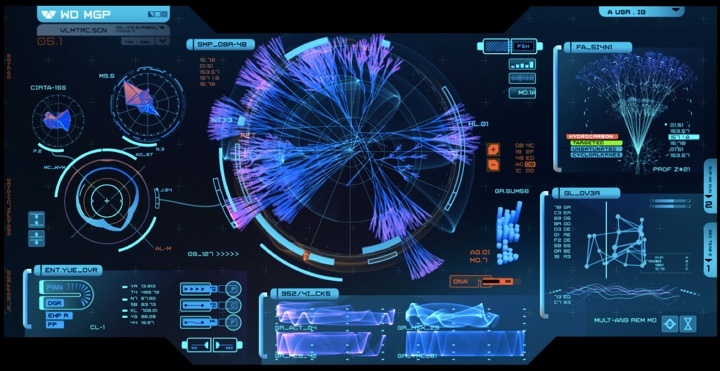 The things you create for the sets of “Prometheus” or “Skyfall” are not fully-fledged stacks with layers of networking, database and what not. You’re effectively creating the tip of the iceberg. Is it liberating to create software that you don’t need to maintain, evolve or to sell to people? 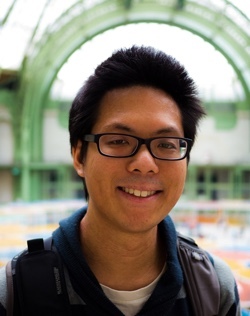 Shaun: I’ve never worked as a software developer, other than when I worked as a web designer – which doesn’t really count. But even then I found it pretty frustrating. That was back in 2001, and you had to test it on all the different browsers and different operating systems, there seemed to be less standards, you couldn’t even be sure how text would appear. It felt pretty unsatisfying as a visual designer. When you’re designing for films, you have more control visually. And the way that actors interact with it is quite basic. They don’t literally operate the computers. They might be just advancing a film loop; it is kept really basic. The actors don’t have enough time to learn how to use a piece of software. I really like that we don’t have to do too much development per se. But at the same time I wish I knew more about it, because maybe we can solve some problems more naturally if we created working programs – not necessarily as robust as what you’d produce for general consumption, but something that would increase the level of interactivity on a film set. Kirill: Do you see the ideas that you and other people are exploring in the movies being influenced and influencing the real world software? Shaun: Definitely. Whenever we design a screen in a film, we look at actual interfaces that exist. It helps in believability, and it helps just coming up with new ideas – seeing what other people have done. And as far as films influencing the real world? That’s a tricky one. In some ways software is so innovative right now, and I feel that films are a little bit behind. A lot of films these days use gestural interfaces because of the iPhone, and to be honest, I’m sure there are interaction models way beyond just swipe and pinch that we will see in the real world. Look at Google Glass, for example. When you’re solving these kinds of software development problems, you’re innovating a lot more than presenting graphics in a film. A film is about storytelling, about visual design and aesthetics most of the time. If a film influences some of the real world, that’s an amazing moment. But to be honest, I’m not sure software developers need influencing. Everything is moving so fast and they are right at the cutting edge. Airlock screen graphics. Note the pervasive usage of yellow accent color. Courtesy of Shaun Yue. Kirill: But going back to what you said, reading brainwaves and automatically acting upon those is not something you can easily put on the screen and contribute to the story in a meaningful way. Or even with Google Glass, you’d have to constantly switch between what the person sees on that small screen, and what is happening around her. Shaun: Films have to tell stories, and every decision is based on that. As you say, it’s very challenging to try and present these new technologies in film. The people making the films need to have a progressive interest in technology, Alex McDowell is a good example, otherwise it may not be presented in an innovative way. That’s probably the biggest challenge that film screen graphics has currently. Kirill: Do you ever think of looking back at your work in 15 years and thinking how ridiculous it looks with the knowledge of what actually happened in between? Shaun: I’m more afraid of it looking ridiculous on the movie’s opening weekend [laughs]. It will definitely look unrealistic in 15-20 years. For me, it’s about working with great people on really interesting projects. Working on the 50th anniversary Bond felt like a huge privilege – to work with Sam Mendes and be part of his vision for what he wanted that film to be. And if computer graphics date a bit, that’s not really a problem because this film was made in 2012. It’s not about predicting the future, it’s about presenting a design idea and contributing to the film’s narrative, and hopefully it stands up on its own. All technology dates. Kirill: How does it work on a more technical side of things? Does what you create in your tools go directly to on-set screens? Shaun: It depends. If the display is in the background, it might just be a video loop. We design it in After Effects and it looks like an active UI, but it’s just a QuickTime or image sequence loop. But when you get a more complicated scene, like when Shaw interacts with the medipod in “Prometheus”, when she touches the panel and says she needs a Caesarean, that was built as an interactive set of video loops. In this case the actor is interacting with a touch screen, and it has to be coded. You have to tell the actor where to touch – although in that case we had made the whole bottom keyboard panel active so she could do whatever she wanted, and it would work. You don’t have to do any user testing, and in terms of delivering the final product, it’s a very basic piece of software. It’s an actor’s aid. Kirill: Does your on-set stuff ever crash, causing extra takes? Shaun: Thankfully that never happened! The tools we use are pretty basic pieces of software so its fairly stable. Sometimes things don’t work as expected, so you might have to make last minute changes or fall back on a Quicktime. That’s why you have to keep things as simple as possible on set, because the most important thing is to film the footage. Kirill: What’s in your personal list of things that you enjoy watching? Shaun: I love all sorts of movies. When you work on films, you start appreciating all aspects of craft and that makes any movie interesting. At the moment I’m obsessed with the TV show “Girls”, I’m blown away by its directing and theatricality. I don’t watch movies specifically for the computer interfaces – that just happens to be my involvement with making films. But it’s been amazing to work with Ridley Scott, as he was a huge influence when I was younger. He has the experience of an older generation, a mix of pragmatism and artistry which seems rarer now as film development seem so corporatised. Technology has permeated into the society so deeply. When you think about how old Google or Facebook or Twitter is, they barely a decade old, and we take it all for granted now – it’s amazing. When you ask me whether I worry about how something will appear in 15-20 years time – I don’t worry, because I know it’ll be so different. It’s not just the user interface design, it’s also about how information is aggregated, processed and presented. At the moment the web is still very much a fixed media of text, images and video. Imagine if every video and audio recorded was automatically transcribed, and it was all semantically searchable, maybe using crowdsourcing. Information as it exists right now does not yet feel malleable. It’s getting there, but I think in the future our notion of information will be so different, so fluid. That’s why I don’t worry about how user interfaces appear in a movie because that’s not the only thing that will date. The thing that will date is the fact that information itself is changing. It slightly scares me that mainstream computing might overtake what happens in the cinema. We’ll have to rethink how we present technology in film, but that will be really interesting. “Skyfall” Screen Graphics by Blind Ltd London. “Skyfall” © 2012 Danjaq, LLC, United Artists Corporation and Columbia Pictures Industries, Inc. All rights reserved. “Prometheus” © 2012 20th Century Fox. All rights reserved.